Holy week is a week of Christian reflection on the events that lead up to Christ’s resurrection. To help our understanding of how much God loves us. It also teaches us to love. In our Parish, we mark the Holy Week events starting on Palm Sunday. The children re-enact the triumphant entry into Jerusalem at the 10.30 mass. We have a Children’s meditation on the Stations of the Cross at 12 noon on Good Friday. Our participation in the Lenten season prepares us to complete the journey through suffering and death with Christ. Palm Sunday – we gather to witness the triumphant entry of Jesus into Jerusalem. Holy Thursday – we gather around the table of the Lord and recall his words to “do this in memory of me” which includes the washing of feet. 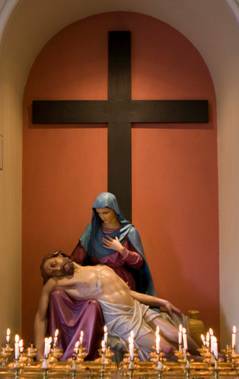 Good Friday – we meditate on the Stations of the Cross. We gather at three o’clock to mark the death of the Lord with the veneration of the Cross and communion service. Holy Saturday – we gather for Morning Prayer.